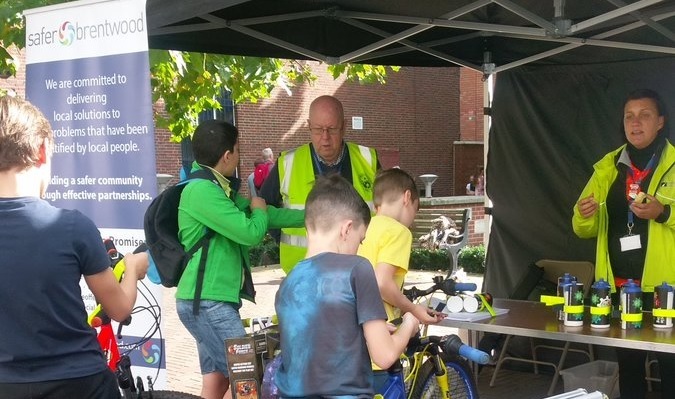 The SERP Bikeability team partnered recently with the Brentwood community policing team to organise a successful cycling safety day. The idea stemmed from a similar event staged in Harlow during August. The request came from police community support officer (PCSO) Sarah Kelly following an increase in the number of young people cycling in an unsafe manner in and around Brentwood town centre, coupled with a spate of bicycle thefts in the area. The event, which took place on 30 September, saw PCSO Kelly and the Bikeability team distribute free cycle safety packs to help young people protect their bikes against theft. The packs, paid for with money seized from criminals under the Proceeds of Crime Act (POCA), contained a range of cycle safety accessories including a bike chain, seat cover, security covers and ultra violet pen. During the event, which took place on 30 September, PCSO Sarah Kelly tweeted: “Some very important advice being given to our young cyclists”. “We spoke to a number of young people aged 12-15 years about the importance of wearing a helmet and being aware of other people around you if you cycle on the pavement. “We obviously told them that it is illegal to cycle on the pavement – most of them were unaware of this – but if they were going to, we explained how to be considerate around pedestrians. In particular, we asked them to look out for older people and small children who can easily run across a cyclist’s path.